pCMV5-Flag-FOXO3a was transfected into HEK293 cells and cells were serum starved overnight and stimulated with or without arsenite (0.5 M) for 60 mins. 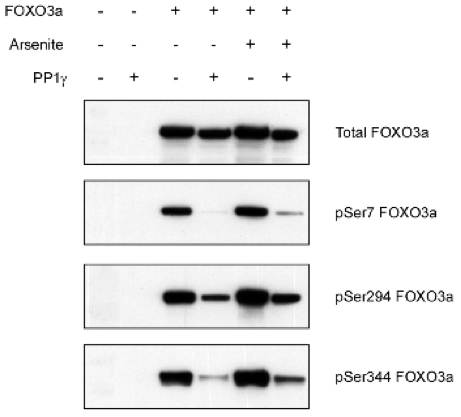 Flag-FOXO3a was immunoprecipitated from 100 μg of cell lysate using an anti-Flag antibody (Sigma). The immunoprecipiate was split into twice, with one half treated with or without 1 mU of PP1 gamma for 30 mins at 30 °C. Samples were subjected to SDS-Page analysis before being transferred to nitrocellulose membrane and immuno blotted with the appropriate phospho specific antibody at 1 μg/ml or anti-FOXO3a (Upstate). Binding of the primary antibody was detected using rabbit peroxidase conjugated anti- sheep IgG antibody (1 in 10, 000 dilution, Pierce) followed by enhanced chemiluminescence (ECL, Amersham).